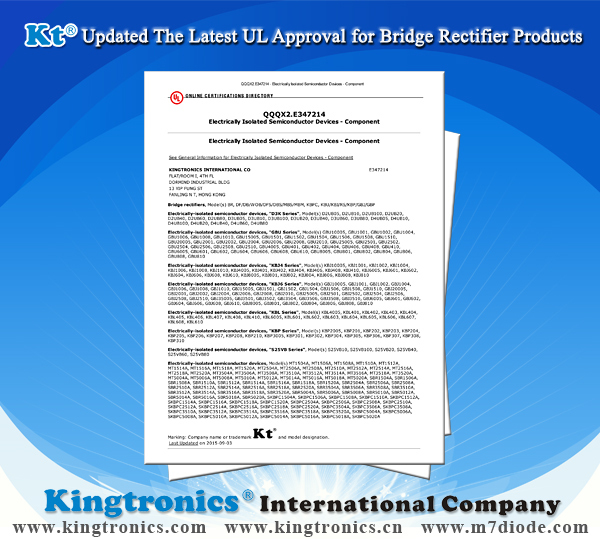 Here bring you a piece of good news of Kt Kingtronics, that the latest UL Approval for Bridge Rectifier Products has been updated. Those products with the UL Mark should be considered to be certified and covered under UL's Follow-Up Service. Quality guaranteed. If you need our full set of Kt Kingtronics UL Approval for Bridge Rectifier Products, please free feel to contact with our sales department. We are sincerely looking forward to build a business relationship with you.